Still Streakin! 7-0! 7-0! 7-0! The Wilkes Barre-Scranton Pens are still the #1 team in the AHL. They confirmed this Friday night with a commanding 4-1 victory at Glens Falls against the Adirondack Phantoms. I'm starting to run out of good things to say about this team, as they seem to have every aspect of the game adequately covered. Their defense was superb tonight, especially considering they were recently bolstered with the return of solid blueliner Andrew Hutchinson. Hutch had a very good return to the AHL, accumulating 2 points and assuming his role as powerplay QB. Eric Tangradi also made his AHL season debut. He looked ok, and he should be just fine after a few games to get re-adjusted. The Pens got some contributions from some grinders and others not accustomed to scoring, which is always a good thing. Ryan Craig slammed the first one home early in the 1st period to give the Pens an early lead that they would not give up for the rest of the game. Carl Sneep resumed the party in the 2nd with his 1st career AHL goal. Perhaps the most surprising contribution came from charismatic team enforcer Jesse Boulerice. Boulerice scored to put the Pens ahead by 3 and essentially lock up the game for the boys from the WB. 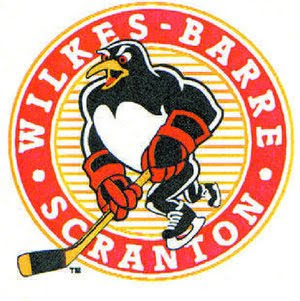 David Laliberte did beat Theissen once for a Phantoms' goal, but it was negated by a late Nick Johnson goal to finish the game 4-1 and keep their advantage on the rest of the AHL. Theissen was good when he had to be, but in general the defense did a good job keping the puck from getting to him. Huge road game in Hershey tomorrow, and a win would be so huge for the Pens even though they will hold their 1st place no matter who wins.